One of my favorite linkies is this Must Read Mentor Text (gives me an excuse to buy more books!). Amanda & Stacia are to blame for our huge wish lists on Amazon, but I still love those girls! 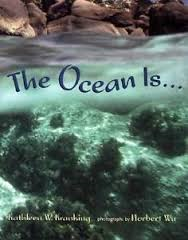 This book compares the ocean to several things with illustrations/text to support the metaphor (traffic jam, playground, dentist, a stage, a galaxy, etc.). So many comparisons to describe the ocean gave my students concrete examples of metaphors. We made our own metaphors based on our own classroom. Each student wrote a metaphor for "Our classroom is..." and then a small description to support the metaphor. Their metaphors were so deep and thoughtful! This melts my heart! It makes me smile to hear my students talk about our class family! All of my students did an amazing job! Focusing and creating only one metaphor is a not so scary assignment for writers, but very purposeful! I've noticed several students effectively using metaphors in their writing since this activity. After I display them, I will make them into a class book. Go check out all the other great mentor texts suggested today! Don't forget I'm having a 20% off Super Bowl Sale at my TPT Store today! And, I added two new products last night! Reading Non-Fiction With Post-Its (great to hold your students' thinking while interacting with text) and Decimal Mixed Numbers Scoot Game (fun, engaging way to introduce, review, or assess your students)! Their metaphors are great!! I will have to share this idea and mentor text with the sixth grade teachers in my building...they are all about figurative language right now! Okay......lets see if this thing works!! I am keeping my fingers crossed, and thanks for your help! Ah, how sweet! Lovin' that glue metaphor. I MUST go order this book now!! !